You can no longer ignore K-beauty (the K-pop of Korean beauty) now that Sephora has the stunning visage of Korean model Ji Hye Park (in a Chanel cruise 2016 show-inspired hair look) splashed over every window display across America. And yes, to the skin care aficionado, the likes of the Egg Mousse Soap by Too Cool for School (their boutique is a must-visit if you’re ever in Seoul, btw) and Tony Moly’s Egg Pore Blackhead Steam Balm are nothing new. But if you’re a newbie to the phenomenon, don’t fret. Before you go venturing into the world of snail slime and fermented wonders (not to mention the obsession with eggs apparently), up your skin care game with the addition of these K-beauty basics: cushion compacts, hydrating toners and sleep masks. AmorePacific Color Control Cushion Compact, left, and Sulwhasoo Perfecting Cushion. 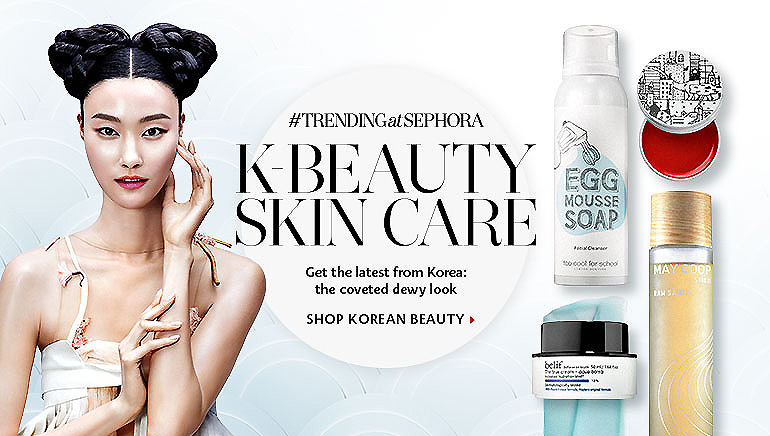 Of all the K-beauty innovations, this is the one you have to get into your rotation. Venerable Korean brand AmorePacific introduced the first cushion compact, Color Control Cushion Compact Broad Spectrum SPF 50+, a couple years ago, but the cushion compact didn’t really take off until Korean actress Jun Ji Hyun used Iope’s Air Cushion XP on the mega-hit K-drama My Love From the Stars last year. Now people across the globe can’t get enough of the liquid foundation sunscreen in a compact, perfect for reapplying throughout the day without messing up your makeup. It also helps that the cushion compact imparts the perfect mul gwang (“water sheen complexion” — that chok chok wet look Korean stars favor) with one application. How genius is the technology behind the cushion compact? According to Iope brand manager Song Jin-ah, parent company AmorePacific’s scientists had been researching for years for a solution to the problem of reapplying sunscreen every two to three hours for effective sun protection — I mean, who wants to smear a sunscreen on over makeup in the middle of the day? The scientists were inspired by a “parking stamp” and created a compact with a sponge-like material. Press on the sponge with a special ruby cell puff, which holds 1.6 times more water than a synthetic latex puff, and simply “stamp” (don’t smear or rub) on the liquid sunscreen onto your face, on top of your makeup. Since it’s tinted, the product blends in even if you already have foundation or powder on. And since it comes in a compact, it’s completely portable. And don’t think that just because the cushion compact is a liquid that it’s less effective or offers less UV ray protection than a heavy lotion. According to Song, existing sunscreens were either a “water-in-oil type,” which helped them last and resist sweat and water, but felt heavy and sticky, or “oil-in water type,” which are “much lighter, but have less durability.” What AmorePacific and Iope did was create a “freshwater-in-oil-type” sunscreen for both durability and a lighter feel. I can’t rave enough about cushion compacts. It truly is a skin saver — it saved me on my trip along the Turkish coast and no more worrying about midday or commute-home sun exposure! (It even works brilliantly on top of powder foundation — who wouldathunk?) And with dermatologists insisting that the one thing every single person must do for their skin is wear sunscreen every single day, 365 days a year (and reapply every two to three hours! ), the cushion compact could not have come at a better time. Though Iope Air Cushion is only currently available at Korean cosmetic boutiques or through smaller sites on Amazon, there are plenty of other options available. After trying many of them, my personal favorite is Sulwhasoo’s Perfecting Cushion. It offers better coverage and its darkest shade (No. 25) doesn’t make me look like a ghost. For darker skin tones, Lancôme has now gotten into the cushion act and offers a good range of 11 shades. 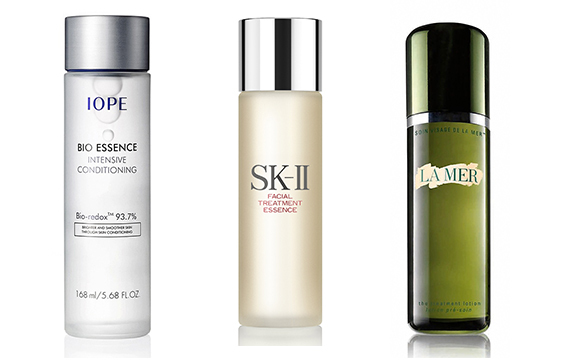 From left: Iope Bio Essence, SK-II Facial Treatment Essence, La Mer The Treatment Lotion. Another top seller from Korean brand Iope is its Bio Essence, a part of that step in any respectable Asian skin care regimen that includes what is called “lotion,” “skin lotion” or, to some old-school Koreans, simply “skin” — a watery gel-like solution for the face used after cleansing. It’s different from the toner that we here in the States may have grown up with — that harsh, alcohol-based liquid we swept over skin with a cotton ball to wipe off any residual makeup that our cleanser may have missed. Rather, “lotion” is a post-cleansing hydrator, usually applied by sprinkling into hands and pressing the palms over the face to ensure proper penetration. It’s a step that “provides hydration to the skin that might be stripped during the cleansing process,” says Diane Nakauchi, skin care expert and CEO of Japanese skincare brand Koh Gen Do. And these newest iterations of lotions go beyond just hydrating — some balance skin’s pH levels; others refine and exfoliate. But perhaps the best reason to add lotions to your skin care regimen is what they all do: prep skin so that subsequent treatments can more effectively penetrate skin’s top layer. The result? All those expensive serums and creams work more effectively with less. Skin care companies have quickly jumped on board and are bringing these post-cleansing hydrators — whether called “lotion,” “water,” “essence” or even “toner” — to American consumers. Some of our favorites include the botanical-based gel-liquid of Koh Gen Do Oriental Plants Lotion; SK-II Facial Treatment Essence, featuring 90 percent of their signature skin-rejuvenating ingredient, Pitera; and the super luxe La Mer The Treatment Lotion. 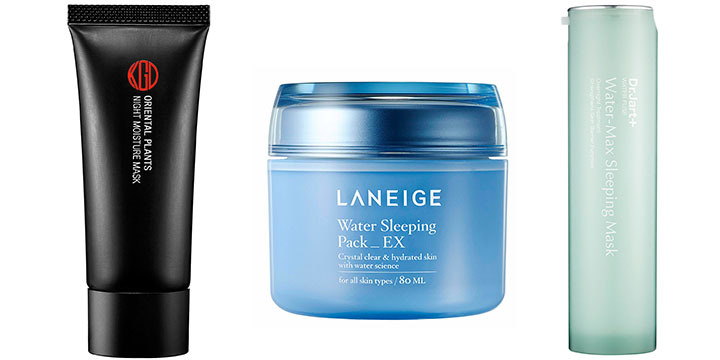 From left: Koh Gen Do Night Moisturizing Mask, Laneige Water Sleeping Pack EX, Dr. Jart+ Water Fuse Water-Max Sleeping Mask. A sleep mask, also called a night pack or overnight mask, is the last thing you put on your face before sleeping. It has a higher concentration of “sealing” ingredients (which often are not suitable to wear under foundation as it may affect the wear of the foundation), says Nakauchi, which helps to seal in moisture, preventing moisture loss during the night as your nighttime skin care ingredients work overtime to repair skin. Adapted from a story written by me, originally published in Audrey Magazine.